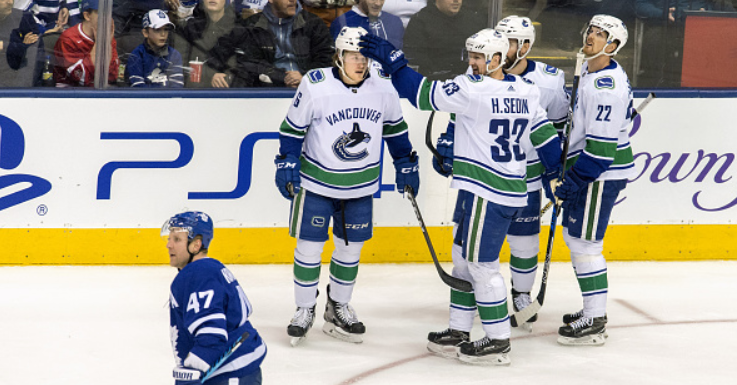 Life After The Sedin’s: Who is Canucks Next Captain? On Thursday night there wasn’t a dry eye to be seen at Rogers Arena. Henrik and Daniel Sedin are officially retiring from the game. Although Arizona gave the Canucks a hard time- Daniel’s overtime winner sent Vancouver fans into ecstasy. Officially the greatest pair of twins and the highest scoring Swedish duo in NHL history. The only thing that was missing for the Sedins was their names on the cup. Vancouver has one hell of a task replacing these guys. Henrik slowed down more in his final years but was still the assist king. Both on and off the ice, these guys commanded great respect. Whoever steps up to the plate next for the Canucks will need to be the right choice. Here is a shortlist of players who could fill the void as captain of the Vancouver Canucks. In keeping with having a Swedish leader, Edler fits the bill perfectly. Now the most experienced member of the side, the 31-year-old has been a consistent presence since 2006. Vancouver is going to need a stabilizing force next season. While he may not be a superstar like his countrymen, Edler is still highly respected. On the ice, you may not notice him. However, as a blueliner, he is a tough and physically demanding presence. Right now, Edler is probably the number one choice to take the ‘C’. Another loyal servant of recent years, Tanev is only 28-years-old and currently one of the first choice D-Men. A calm yet authoritative leader, the Ontario native is another name to consider. While Tanev may not have the same physical presence or experience as Edler, he is nonetheless one of the Canucks most underrated stars. Experience doesn’t always mean instant leadership and Canucks may see Tanev as the future, although he has yet to score more than 20 points in a season. His checking and puck-moving skills alone make a polished gem. On the surface, it seems like Brandon Sutter is your average 2nd/3rd liner. But look closer and you will notice that he is a natural leader on the ice. A decent two-way forward, Sutter has had some tough luck with injuries since arriving in 2015. This season he chalked up 25 points and was their top plus/minus guy with +8. There is a maturity to his style of play which Canucks will need during this difficult transitional period. His short time in Vancouver shouldn’t be held against him because he is one of the more experienced members of the squad. This one might be worth considering for the future. Still, you cannot deny that Bo Horvat has been effective. In 2016-17 he was the Canucks star man. Although this season his contributions were overshadowed by the emergence of Boeser. Vancouver splashed out on a multi-year contract for the 22-year-old. This shows the sheer confidence have in his ability. Horvat is a slow-burning future star and it isn’t completely impossible he won’t get the job! Horvat is a key piece of the future equation- but when do they give him the big job? While Edmonton took a successful gamble with Connor McDavid– it seems unlike for Canucks to do the same with Boeser. This season he’s been the out and out star. It’s easy to see how Vancouver management could be tempted to give him the reigns. Boeser is a great individual talent, but he’s not a complete team player just yet. The ‘C’ will likely be stitched on his jersey in the next couple years. In the short term, the Canucks need a leader, not a star. Whoever Vancouver appoints next will need to be the right choice. Trevor Linden and Travis Green better think very hard.